I have not been a big fan of romance novels recently. There was a time when I just wouldn’t stop reading love stories but it seems that that phase is behind me now. I had read a few of Nikita Singh’s novels before and I have always admired her work. She has a fresh touch and I enjoy her simple college love stories. 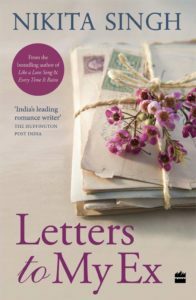 When Letters to My Ex came out, I was excited about it because it would be after a long time that I would be reading a romance. Letters to My Ex is a simple love story narrated in a very unconventional format – the story is told by the way of letters which the lovers write to each other over a period of months. When you pick this book up, don’t set your expectations too high as it will only disappoint you. The same happened to me and hence this warning comes from my own experience. Nidhi is heartbroken and dejected. She is failing miserably in life. Currently, every aspect of her life – personal, work, love, family – is a huge disappointment. The reason is not that she was ditched by her lover but because she ditched her love on their engagement day in front of everyone. I know it sounds cliché, I felt the same too. So, after ditching her boyfriend of over 5 years for reasons which aren’t even known to herself, she isn’t a very happy soul. 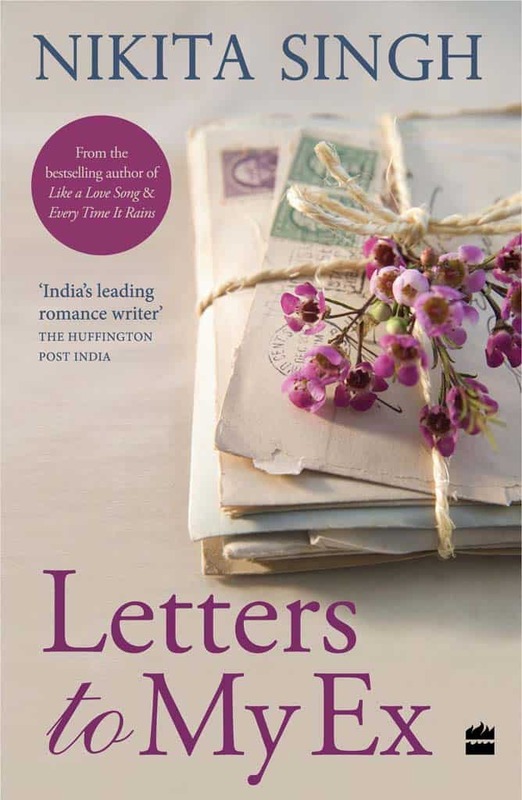 To overcome the pangs of guilt and hopelessness Nidhi decides to write letters to her ex. In doing so she is only relying on the healing powers of this writing therapy; she doesn’t intend to ever post these letters to Abhay. However, a chance encounter near a coffee shop becomes really awkward and before long, the separated couple actually start writing to each other – texts, emails and eventually letters. This book is the story of Nidhi and Abhay and their life after the engagement fiasco. How good is the writing style? Nikita Singh’s writing style is very poetic. Her words have a music and the emotions and passion with which her narratives are delivered are truly commendable. Her ability to understand and express human insecurities, shortcomings and the deepest of feelings from the darkest corners of the heart is worth an applause. However, when this is combined with a lacklustre plot, it fails to shine. Letters to My Ex is a very good example of how a cliché and below average plot doesn’t work even for a best-selling author. The plot is almost non-existent and before you know it the story is moving towards the climax. The characters are an okay bunch. I enjoyed reading about Abhay – he seems like a decent, rational, mature and dependable guy. Nidhi, on the other hand, was very absurd – too high on drama and very irrational. She was always so full of herself and never knew what she wanted. I found her character to be very irritating and even boring. Barring these two there is only one more character Simran who wasn’t given much attention for the reader to form an opinion about her. As you must have already guessed by now, the climax of the book is a cliché too. There aren’t any twists and surprise elements to speak of. It is very predictable and hardly satisfactory. Furthermore, it is rushed and abrupt and poorly narrated. My final verdict would be to skip Letters to My Ex if you can. There are a good number of Nikita Singh novels and other romance novels that you can read instead of wasting your time and money on this one. Pick the book only if you are a diehard Nikita Singh fan and don’t mind a dull read. Skip the book if you are expecting it to be an entertaining read. Can’t wait to read Letters to My Ex? Buy your copy at the link below.